There's nothing quite like posting shots from a Rainyhagen on a day with brilliant sunshine and optimal beach weather like today. 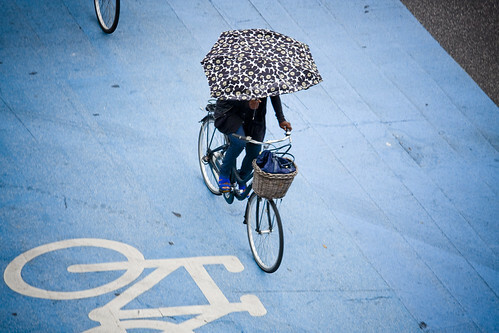 The oh so blue bicycle lanes of Copenhagen - avec parapluie. On a more serious-ish note, Copenhagenize.com has a piece about a new traffic safety campaign from the Danish Road Safety Council [Rådet for Større Færdselsikkerhed]. So - now I am the proud owner of a new bike. I had to have one until my Dutch bike gets shipped here, so I went for a lightweight city bike. Now - any idea where I can get a "I (bike logo) CPH" T-shirt? Strange question, but do European bikes have coaster brakes? I can't imagine being able to use an umbrella (which, in Portland, OR, is a good thing to have) and my front and back brakes at the same time? coaster brakes are standard issue in most countries. 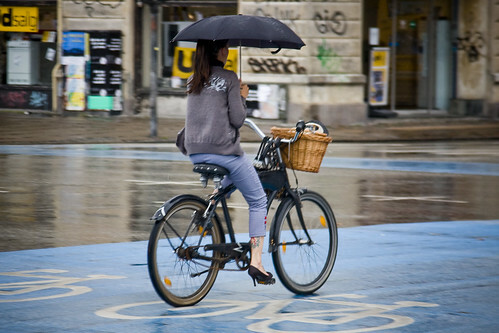 although using an umbrella at the speeds we ride in europe is no problem with hand brakes. just take it easy and gently squeeze the back brake. Wouldn't all that wet paint be quite slippery? that's not paint, it's a plastic type of material mixed with sand. gives the same traction as asphalt. Another sub-standard braking solution is fixed wheel. I am always scared that I'll forget about it, stop pedalling, and have my legs wrenched out of their sockets. I love that the woman in the capris is so retro. With her pants, cardi, tattoo, basket, and cruiser looking bike. Her sense of style is so strong. coaster brakes are not for slamming. they're for coasting, while gently pressing backwards while you roll towards a red light. there's a reason that they are the most popular brake in the world.